We’d love your help. Let us know what’s wrong with this preview of Everyday Apocalypse by David Dark. The term "apocalypse" usually evokes images of mass destruction-burning buildings and nuclear fallout, or even rapture and tribulation. Often, our attempts to interpret the imagery of the book of Revelation seem to carry us far away from our day-to-day existence. David Dark challenges this narrow understanding in Everyday Apocalypse, calling his readers back to the root of The term "apocalypse" usually evokes images of mass destruction-burning buildings and nuclear fallout, or even rapture and tribulation. Often, our attempts to interpret the imagery of the book of Revelation seem to carry us far away from our day-to-day existence. David Dark challenges this narrow understanding in Everyday Apocalypse, calling his readers back to the root of the word, which is "revelation." Through readings of Flannery O'Connor stories and savvy discussion of The Matrix themes, Dark calls us to imagine the apocalypse as a more watchful way of being in the world. He draws on the sometimes unlikely wisdom of popular culture-including The Simpsons and films like The Truman Show-to highlight how the imagination can expose our moral condition. Ultimately, Dark presents apocalypse as honest self-assessment and other-centeredness in the here and now. To ask other readers questions about Everyday Apocalypse, please sign up. Even after I rejected the notion that Christians should only ever listen to music that explicitly glorifies Jesus, I had this strange, lingering guilt whenever I listened to a song with a swear in it. Until I read this book, that is. Turns out Radiohead are prophets. Who'da thunk it? Can a book be any more thought-provoking? Can a man be any more gifted in weaving ideas eloquently? Well, David Dark does all the above. Such a refreshing book. Really liked this book. I find everything that David Dark writes contains value and insight. He sees the sacred & the "Christ-haunted" revelations in popular culture and shares them with those of us who are too distanced & distracted from the world to engage with it. This book focuses on the need we have for apocalyptic vision & voices to disrupt, confront, shake us & wake us into transformation and into being prophetic presence and witness. Robert Benson writes in "We Are All Apo Really liked this book. I find everything that David Dark writes contains value and insight. He sees the sacred & the "Christ-haunted" revelations in popular culture and shares them with those of us who are too distanced & distracted from the world to engage with it. This book focuses on the need we have for apocalyptic vision & voices to disrupt, confront, shake us & wake us into transformation and into being prophetic presence and witness. Robert Benson writes in "We Are All Apocalyptic Now", "Instead of predicting the rapture to come, apocalyptic vision can help us understand social and ecological ruptures in the here and now." That's what David's book is all about and he uses the Simpsons & Radiohead, among others, to do it. As I’ve maintained throughout the present work, apocalyptic breaks through the “spiritual,” the “personal,” the “private,” the “religious,” and whatever mad categories have kept a necessarily incarnate faith in an incorporeal state. It serves as a remedy by freeing the captive imagination from its sentimentalizing, “deep down in your heart” reductionisms. It extends and demands a deeply imaginative charity that transcends and scandalizes all our tired understandings of “good.” The summons is to a scandalous superaliveness that thinks and acts differently. The possibility of actually acting differently can be kept at some conveniently impossible distance from our everyday consideration as long as we keep Jesus “spiritual.” We can view him as a kind of phantom friend who absolves us of our guilt feelings, expands our territory, and promises to take our “souls” to a faraway place when we die, just so long as we ask him into our “hearts” as the savior of our “spiritual” selves. There’s a lot of money to be made in this sort of nonsense, and it certainly has a way of filling up meeting spaces on Sunday mornings. But it doesn’t bear any resemblance to any recognizable orthodoxy within the historical Christian faith. It is, rather, the almost purposefully useless, deliberately shortsighted, politically irrelevant religion that will often inspire contempt among honest people. The apocalyptic believer will be light-heartedly aware of the inadequacy of even her most heartfelt words and expressions, as well as her natural tendency to shrink-wrap the revelation into more easily digestible and manageable forms. This is the healthy skepticism and suspicion that begins with self-doubt and extends itself to doubting the be-all-end-all claims of one’s own culture. A fully “spiritualized” Jesus will never challenge these claims, but the Jesus of John’s Revelation does and thereby relativizes, without denying, all the lesser beauties that elicit our distracted claims of “awesome.” When we read Revelation attentively, we will feel all our presumptions, idolatries, and shrink-wrap giving way to a newness we cannot control or fully understand. In my own debilitating tendency to read the Bible as if it says what I already know and believe instead of reading it repentantly with a mind ready to yield to transformation, I need whatever I can get my hands on to better get my head around the meaning of indefatigable, irrefutable, and embarrassingly credible apocalyptic. If it doesn’t challenge my preconceived notions in any way, if its superaliveness doesn’t leave me chastened, I’m probably not looking at it properly. Our inclination to run from the shocking grace that will transform our lives and our world is difficult to overestimate, but the superaliveness, like apocalyptic, is irrepressible. All shall be made alive with laughter. It unveils, before our eyes, the not-to-be-mastered whole of a world without end. Read the Radiohead chapter, and it has influenced how I think about every Radiohead song I hear. Academic, moderately difficult read, but worth the time. There's a difference between truth we identify with because we've experienced it and truth we recognize because it is explained to us. David Dark, for me, offers the latter type, and I'm digging it. It seems rare to discover someone who has this gift. Hence, I've updated my rating to 5 enthusiastic stars though I still have over half the Read the Radiohead chapter, and it has influenced how I think about every Radiohead song I hear. Academic, moderately difficult read, but worth the time. There's a difference between truth we identify with because we've experienced it and truth we recognize because it is explained to us. David Dark, for me, offers the latter type, and I'm digging it. It seems rare to discover someone who has this gift. Hence, I've updated my rating to 5 enthusiastic stars though I still have over half the book to read. I've now read (twice) the Flannery O'Connor chapter ("You Think You Been Redeemed: Flannery O'Connor's Exploding Junk Pile of Despair") and am almost finished with the Simpsons chapter ("Impossible Laughter: An Appreciative Response to the Simpsons). As with the chapter on Radiohead, I found Dark's observations and analyses of O'Connor's work will assist me toward fruitful consumption of her stories. He's managed to explain her underlying themes in a way to make me say, Yes! That's it! My own attempts to explain her have been elusive, but Dark's work is clear, efficient, and given in such a way as to be useful to daily living itself rather than a drab, uni-purposed piece of accomplished literary criticism. Of the Simpsons chapter, all these things are also true, and in addition I've noted how diverse are the sources from which he draws connections to his thesis: Ben Stein, Malcolm Muggeridge (BBC guy and journal editor), Jonathan Swift, Walker Percy, Shakespeare, Wendell Berry, Eugene Peterson, John Coltrane and others - theologians, literary critics, political theorists. David Dark’s name defies his mission: to bring to light that which is hidden. In his densely intellectual address of truth revealed in such pop culture icons as Beck, Radiohead, Homer Simpson, Coen brothers movies and more, he not only opens eyes to beauty cleverly—and purposely—hidden among seemingly mundane entertainments, but he also more aptly defines the very word apocalypse itself. Having come from the Middle English word for revelation, it is not always the cataclysmic end of the world co David Dark’s name defies his mission: to bring to light that which is hidden. 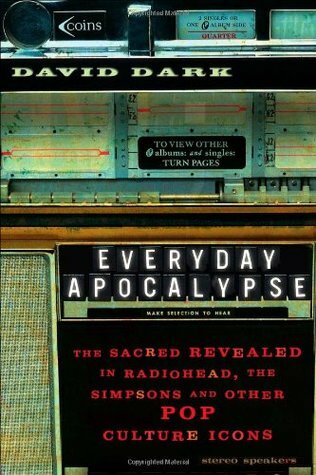 In his densely intellectual address of truth revealed in such pop culture icons as Beck, Radiohead, Homer Simpson, Coen brothers movies and more, he not only opens eyes to beauty cleverly—and purposely—hidden among seemingly mundane entertainments, but he also more aptly defines the very word apocalypse itself. Having come from the Middle English word for revelation, it is not always the cataclysmic end of the world commonly associated with Christianity. It is at its very core the opening of doors into the unseen world of spirit and heart for all who are willing, like Neo of the Matrix, to see a reality that might prove horribly inconvenient. He challenges us to allow ourselves to be moved by the weird and the irreverent to, well, reverence. It’s a paradox, but apparently this method of prophetic teaching has worked for millennia, and he contends that everything, when seen with an artist’s eyes, can contain the devastating beauty of a single sparrow, the self-deprecating humor of our own attempts at goodness, and ultimately the intense hope behind every atom in existence. Not a passive read, this thesis will require the use of all your college education for its Dickensian sentence structure and delightfully underutilized words (salvific, datum, etc), which collectively enforce a slow processing that shakes readers awake from the “desensitizing madness” that embezzles our souls. Beware: you may choose the red over the blue pill after all. Or perhaps you already have. The first realization when reading this book is that David Dark presents an alternative meaning of apocalyptic literature. Apocalyptic in this case does not necessarily mean books that represent the end of the world. Instead it represents works (books, movies, music) and ideas that deconstruct and tear down our perceptions of the society (the machine) in which we live, so that we can reach a greater and deeper understanding of our self and the world, thus breaking free in a greater spiritual and The first realization when reading this book is that David Dark presents an alternative meaning of apocalyptic literature. Apocalyptic in this case does not necessarily mean books that represent the end of the world. Instead it represents works (books, movies, music) and ideas that deconstruct and tear down our perceptions of the society (the machine) in which we live, so that we can reach a greater and deeper understanding of our self and the world, thus breaking free in a greater spiritual and emotional awareness. He suggests that as well as the Revelations of the Bible, the literature of Flannery O'Connor, the music of Radiohead and Beck, the episodes of the Simpsons, and the movies of the Coen brothers all represent this kind of apocalyptic questioning. He says the works of the artists here mentioned represent versions of our reality that can seem mocking or bleak, but that really represent a form of hope and salvation for those who are willing to push past the norms as society insists we perceive them, in order to be jolted awake. I think Dark has some very interesting points to make throughout the book, however, I couldn't quite help but feel that there was some sort of a disconnect in his logic. The redefining of apocalyptic, for one, is difficult to take in, and creates a confusing form of terminology to work around. This book describes the scope of God's revelation as something encompassing all art. God revealing truths is in no way confined to any category or affiliation the creators of art/media -or anybody- gives it. New truths/revelation can be found in forms of media that were never intended to convey "christian" messages. I like the way Dark dedicates entire chapters to focus his points on specific media (Simpsons, Flannery O'Conner, etc.). David Dark is awesome (in his writing, his speaking [at Calvi This book describes the scope of God's revelation as something encompassing all art. God revealing truths is in no way confined to any category or affiliation the creators of art/media -or anybody- gives it. New truths/revelation can be found in forms of media that were never intended to convey "christian" messages. probably the best and well thought out summary of the idea of Christianity being "engaged" in pop culture. not that i really care about this all the time, but i think his idea of the apocalypse meaning redemption and Gods Kingdom being manifest in areas that are often considered "secular" or "non-Christian" by Christians is right on. plus its just cool to see how he sees truth and beauty in the radiohead and the cohen brothers etc. Dense, yet accessible, David Dark has written a manifesto for making apocalyptic a normative experience of life and art. Arresting, but ultimately hopeful and inspiring, -Everyday Apocalypse- is a fantastic read, which benefits from savoring, rather than racing through. where IS interface between church and culture to be found? does it exist? David Dark says YES, and what's more: there is not a single secular molecule in the universe. hallelujah. Some interesting ideas, but it feels a little stiff. This man is an absolute genius. Everyone on the planet should read this book. David Dark is a man who knows his way around a sentence. It's rare for me to read a book that lifts me in a special way. This one not only did just that, it also disturbed me. How breathless I was all the way up to the final line. Enter if you dare!